It had become a ritual of the Way. As soon as arriving in the evening, the rucksack was emptied, the sleeping bag laid on the bunk bed and any smelly socks taken to the sink. Hand washing was the usual option using a good travel laundry detergent. With three pairs of socks in my possession, the sock wash was one of the more regular daily tasks. In the morning I slept in. Others were obviously keen to rush off but I found the gite and its garden relaxing. I collected my laundry from the clothes lines in the garden and packed the rucksack once more. It was already hot and a lady arrived to clean the gite. She gave me a baseball cap that someone had left behind advising me to take care in the sun. Leaving the village it was a pleasant climb again into the hills. The weather and path were good. The first village I came across was Montredon. A quiet place where I stumbled upon other walkers who told me that on the other side of the church was a pilgrim stop. I saw Christophe again. He had left much earlier form Livinhac le Haut but was walking slowly. We found the room adjacent to the church. There was a flask of coffee and cakes provided by the local community. It was welcomed as the sun was becoming quite strong and the shade of the room was cooling. A lady appeared and said ‘Bonjour’ before disappearing back into another small room attached to the church. It was a winding path through fields. I caught up with Jacques and Laurent and we all stopped at Bord. 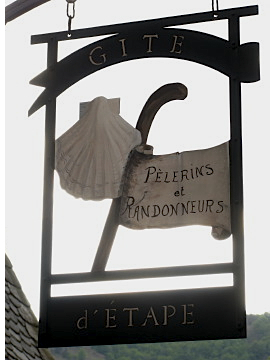 We had seen the signs for a few kilometres advertising a gite and cafe with a pilgrim meal. Arriving we all took the menu in the open gardens of a family house. The meal of salad, fresh omelette and fruit was delicious and after lunch I fell asleep in a deck chair in the garden. Forty-five minutes later I awoke with burnt knees. The others had left so I continued on to Figeac. Everyone has their own Camino. I soon caught up at a small church near Saint Félix. Inside there were many wild birds flying around and sitting on the alter. What was amazing however was that the wall were covered with large frescos depicting birds. Almost like they had been painted because the church was always full of birds. It was a strange experience to be surrounded by the paintings while wild birds were sitting feet away on the alter and crosses in the church. Christophe had said previously that he was ending his walk at Figeac. I wanted to say good bye so I had a beer at the hotel by the railway station. After forty-five minutes he did not arrive so I headed off to the centre of town. I discovered later from others that he had taken a wrong turn, got lost, and completed an extra few kilometres! He was returning to Paris on the late evening train and we didn’t get a chance to say goodbye – the end of his walk for this year. There were no sign for any monastery or gite, just for expensive hotels. I asked around and finally found the Carmelite Monastery. A fantastic meal followed after which I went for a stroll round town. I knew the gite closed at 10pm so was on time when I headed back. I met Laurent and had a beer. We talked about life and why we were walking the Way of Saint James. We were both looking for something else, a simple existence for a while and a calmer life. It was 11pm when I arrived back at the monastery. I was locked out! With the Carmelites not being able to speak to anyone I thought it prudent not to ring the door bell. After waiting till 12.30 a light went on in a window adjacent to the front door and after tapping on the window I was let in by another pilgrim. This entry was posted in From the Way and tagged Via Podiensis, Way of Saint James, Week Two. Bookmark the permalink. Post a comment or leave a trackback: Trackback URL.